The ‘Sappers 4x4 Gympo’ off-road challenge conducted by the Sri Lanka Army Corps of Engineers in association with the Four Wheel Drive Club (FWDC) with the sponsorship of Holcim (Lanka) Ltd, took place recently amidst a grand gathering of over 15,000 spectators at the Sri Lanka School of Military Engineers (SLSME) in Tunkama, Embilipitiya. 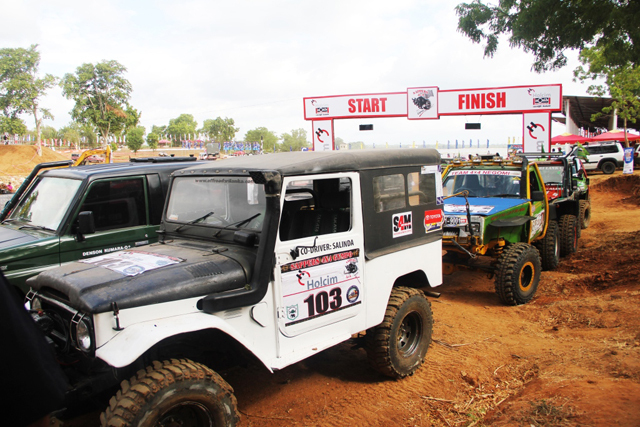 The event which was conducted in five categories such as Standard Vehicles, Standard Modified, Under 3000 cc, Over 3000 cc and Extreme Class saw Indika Sanjaya and his co-driver Navin Marapana emerge as the overall champions of the Sappers Gympo 4x4 2014 in the extreme class for the fourth consecutive year competing among the top 14 teams in Sri Lanka and 4 other foreign teams. The duo also managed to secure the trophy for the Under 3000 CC category. Nigel Veerapperumal and his co-driver Riyald Reffai won the championship in the standard class. Buddhi and Kumudika Gunasekara won the championship trophy in the standard modified and Super 8 open events. In addition, Chaminda Dariju and Dimuthu Fernando won the trophy in the Extreme Class Over 3000 CC while KPR Maduranga won the Street Trail Modified event. H M J S Premaratne won the 125 CC racing GP MX and the 250 CC racing GP MX events.